And wisdom to know the difference. Amen. 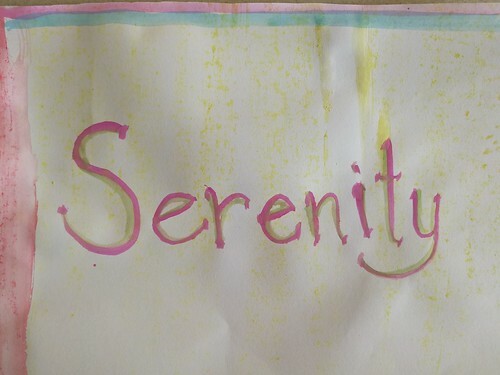 This is my third blog post this year about my one little word–serenity. I introduced my word in January, and shared an update here this summer. Today I feel encouraged because I chose to be committed to a couple of small things this summer, and those commitments are adding to my well being, my sense of serenity. Take a challenge to read 40 books during the school year. Write 750Words at the start of each new day. They seem fairly unrelated to our political climate. However, in 2016 and half of 2017, I was spending way too much time watching and reading political news. Instead I decided to read and write. Recently, on 750Words, I broke my previous record of 62 days in a row, set in 2011. Today, I was up to 74 straight days. It’s interesting how some outside lead measures have helped me to find serenity the second half of this year. Instead of searching for serenity, though, I write in the mornings, often praying for others and counting my blessings–10,000 reasons to say thank you. In addition, I’ve read 7 books since school started, almost on par for my 40-book challenge. 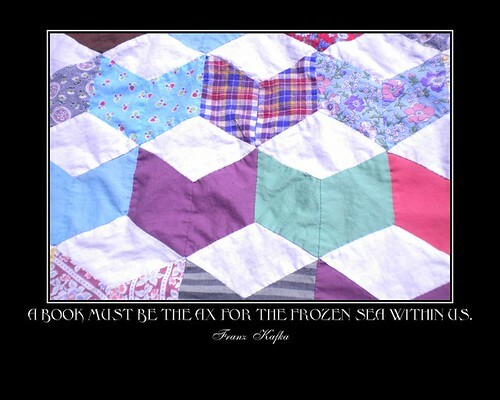 The frozen sea within me is getting chipped away. I don’t have as much time for the news nowadays. Perfect. Instead of trying to say no to the drama and toxicity of our politics, as I had for so many months. I have said yes to writing, reading, praising, and reflecting. As a result I have more serenity. I nod my thanks to the driver of the black Yaris as I pull out of the side lane in front of him. “Go ahead. You can go in front of me,” he says silently. The busy mother with a young child at each hip hurries through the crowd to get to the bus stop on time. The girls’ starched uniform pinafores move like great church bells, their scurrying legs the clappers. I’m sitting at the red light listening to the music my husband put onto the USB. Usually I don’t pay much attention to what’s playing, but this morning, this time, this song had such a sweet and melancholy effect on me. It is “Time of Your Life” by Green Day. I thought of the story that brought us to Bahrain. We were in our late 50’s. No need to make such a radical change, right? But we did. It was so unpredictable. From the beginning it’s been right. Just right. A chance to meet and love people from scores of different countries. From backgrounds, languages, and cultures so radically different than mine. I’m learning so many lessons day by day. This sweet song spoke to me today. Normally I walk to school, but today I drove because I needed the car after school. It’s just a 5-minute walk, so I always know if I will be on time when I walk out the door. However, when I drive I need to leave 20 minutes earlier to make it on time. Today, I missed the 20-minute mark. I was on the road at 6:48. Only 12 minutes to drive less than 1 kilometer. I share the road with many others–adults hurrying to work, delivery men loaded with parcels, parents and drivers darting with their young charges to get them to school on time. As I sat in the long lineup of cars a few blocks from my school, my friend and colleague Victoria walked by. She didn’t see me, and I didn’t even bother to roll down the window and holler at her to hop in for a ride the rest of the way to school. I actually considered how I might ditch my car and walk with her the rest of the way to school so I wouldn’t be so late. The music played on. I listened to the Green Day song twice, and two other songs started and finished by the time I pulled into the lot behind school. I punched in about 5 minutes late. Not too bad actually. I added to my photographs this morning–the still-frames in my mind that I take with me. So many beautiful images. The grandfather pushing the baby in the pram, as he lovingly gazed at the baby’s face more than the bumpy sidewalk he traveled on. The lanky fellow who tripped and stumbled a bit when he stepped off the curb. He caught my eye as I sat at the red light, and he passed an infectious belly laugh to me. Laughter and smiles. 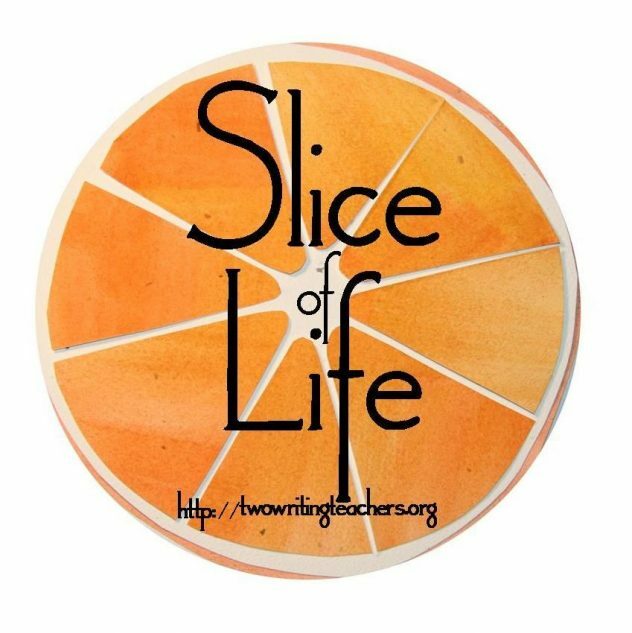 These are the sweet slices of life that I cherish. It’s worth all the while. I’m having the time of my life. I wrote the post below today for Teachers Write, but I thought I would share it here because it’s a slice of my life, though 20 years ago. I was thinking of Arizona a lot today because I baked a lemon meringue pie and because the weather is really hot and steamy here in Bahrain, a little like Arizona during the monsoon season. When I saw today’s prompt, this wondrous mud puddle came to mind. A wondrous puddle is hidden in the Bermuda grass most of the year. Who would have thought there was magic in that small bald patch of yard? The patch near the naval orange tree where the grass can’t grow has the approximate diameter of a large kiddy pool, but the comparison ends there. There is nothing tame about this piece of earth when the rains come. Unfortunately, Mom never let them flood it with the hose. Otherwise they could have enjoyed mud baths all summer long, mud baths that were simultaneously exhilarating and restful. Mud baths that put grit in their teeth, long-lasting cakes under their fingernails, and the smell of magic in their nostrils. Instead, these girls were forced to pray for rain. On this day, monsoon winds come. Dust is in the air. Finally, raindrops the size of 50-cent pieces splotch the deck around the pool and back porch. And, yes, the drops are even noticeable in the sticky caliche soil near the orange tree. The girls watch from the French door windows, willing the drops to keep falling. Please not another false rain alert is their unspoken prayer. So often the muddy drops end as a vain attempt to wash the dirt out of the sky, a tease of petrichor they can feel and smell even in the house. More often than not, in Phoenix, the summer rains stop not only before they wash the dust out of the air, but well before they fully wet sidewalks or muddy the hopeful spot in the yard. This time, though, it’s different. The magic is working. Not just pitter patter. These drops are thunk thunk thunking on the roof, ping ping pinging on the tin cover of the A/C unit in the yard, and quietly invading the dry soil around the orange tree. It is a real monsoon rain. Finally. The season came late this year, but today rain will win the battle to uncover the wondrous mud puddle. My Mr. Fix-it husband would know what kind of motor I needed and how to make the Mars model. I wanted it to be made of cardboard for a shout out of sorts to making, to Caine Monroe, Nirvan Mullick, and the subsequent Cardboard Challenge and Imagination Foundation. Keith suggested I would need a base to hold the motor. He said you’d want to make a base out of plastic or something. I argued. “It doesn’t have to be perfect. I’m not really making it. No one who reads it is going to know if it’s really feasible,” I said. He acted like he didn’t hear me. “OK, maybe,” I said when I woke up this morning. It was also after the part last night, when I snatched my Chromebook from him and gave the I-said-I’m-not-really-going-to-make-it-!-don’t-you-get-that-? speech. “Hey, Bailey, look what I found at work today!” Dad came bolting into the kitchen through the back door, the wooden-framed screen door bouncing behind him. Bailey was sitting at the round yellow Formica table–what Bailey used to call “our sunshine table”–munching Oreos dipped in milk. “Some gals ordered smoothies for lunch and they came with these jumbo straws. Perfect, right?” He held up two shiny straws, one peachy cream color and one lavender. “Yeah, I didn’t think that was going to work,” Bailey was still suspicious about it. My husband talks a lot and makes me laugh. Here are some snippets from our Friday afternoon. “OK, wise guy, you can keep your job.” When I got to the door of the garage, I handed him my regular eyeglasses and waited for him to pass me the sunglasses. I put them on and pulled into the narrow alleyway, into the 110-degree heat. (It feels like 113, so the humidity isn’t that bad today.) “So, which mall should we go to?” I asked my husband, who is exponentially more opinionated than I about such things. “Let’s go to the little fancy mall in the Seef district,” my husband said, “It won’t be so crowded on the weekend.” I turned the car toward the mall of our Friday afternoon walk. “You maybe just heard my voice above all the others because you are so in love.” I could sense him staring and batting his eyes. Lots more side car driving, “50…50…50…the speed limit is 50!” And later, “I would have gotten off at this exit.” That sort of thing until we arrived at the upscale mall. “Thank you,” I said, as someone came up to see if they could help me. “I just wanted to take a quick look.” I slipped out after looking at only one price tag. This place was out of my price range, even with 90% off. It’s a good thing I don’t need a prom dress. On the way home, we enjoyed listening to music on a playlist that Keith created. It has Beatles, Kansas, and lots of his other favorites–pop, rock and roll, and gospel. I’m not really big on music, but one day, I did say, “How about Gordon Lightfoot and Simon and Garfunkel?” My old time favorites. The next time we went in the car, he had a new playlist including some of my favorites. Today, when “Rainy Day Lovers” came on, I asked him if he even likes Gordon Lightfoot. “He’s OK,” he said. We talked about rainy days and loving. When we came back, I baked chocolate-dipped peanut butter cookies to bring to a dinner tonight. That you are, but I wouldn’t want you any other way.